Iron is a redox active metal which is abundant in the Earth’s crust. It has played a key role in the evolution of living systems and as such is an essential element in a wide range of biological phenomena, being critical for the function of an enormous array of enzymes, energy transduction mechanisms, and oxygen carriers. The redox nature of iron renders the metal toxic in excess and consequently all biological organisms carefully control iron levels. 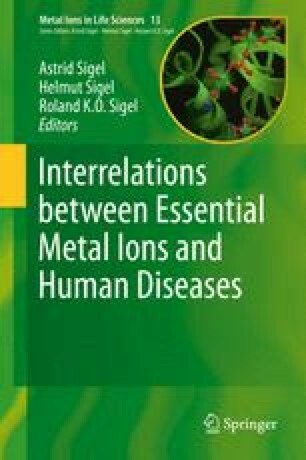 In this overview the mechanisms adopted by man to control body iron levels are described. Low body iron levels are related to anemia which can be treated by various forms of iron fortification and supplementation. Elevated iron levels can occur systemically or locally, each giving rise to specific symptoms. Systemic iron overload results from either the hyperabsorption of iron or regular blood transfusion and can be treated by the use of a selection of iron chelating molecules. The symptoms of many forms of neurodegeneration are associated with elevated levels of iron in certain regions of the brain and iron chelation therapy is beginning to find an application in the treatment of such diseases. Iron chelators have also been widely investigated for the treatment of cancer, tuberculosis, and malaria. In these latter studies, selective removal of iron from key enzymes or iron binding proteins is sought. Sufficient selectivity between the invading organism and the host has yet to be established for such chelators to find application in the clinic. Iron chelation for systemic iron overload and iron supplementation therapy for the treatment of various forms of anemia are now established procedures in clinical medicine. Chelation therapy may find an important role in the treatment of various neurodegenerative diseases in the near future.